The now classic cioppino was originally developed in San Francisco in the late 1800s by Italian fishermen who had settled in the city’s North Beach area. Fresh fish, the catch of the day – typically crab, shellfish, squid and fin fish – are brought together with garlic, tomatoes and wine to make a rich, delicious red seafood stew, usually served with a crusty, rustic sourdough bread . This version is a little lighter, but no less delightful. The more delicate saffron infused broth showcases the delicious sweetness of fresh mussels, clams and shrimp. A little smoked fin fish, and some velvety yellow eye beans add depth and texture. A garnish of gremolata brings up the high notes, and really makes it sing. Steep the saffron in the vermouth. Rinse and sort the beans, and put them to soak in enough water to cover them by at least 2″. Soak for a couple hours until the beans are plumped and smooth. Don’t over-soak yellow eye beans, or they’ll lose their integrity. In a large saucepan over medium-high heat, bring the beans and their soaking liquid to a boil for five minutes, skimming and discarding the thick foam that forms. Reduce heat to a slow simmer, and add the oregano. Cover the pot, and cook until beans are tender: about 45 minutes. When beans are nearly done, add the salt. Put the beans and their pot liquor in a bowl, and keep cool until ready to use. In a soup pot over a medium flame, heat 2 Tbsp oilive oil. Add the fennel, and sautÃ© until softened, about 2 minutes. Add shallots, cooking until softened, then the garlic and red pepper flakes. Cook until the aromas bloom, being careful not to burn the garlic – about a minute. Add the vermouth with the saffron threads. The aromas will be fabulous! Add the wine, and simmer until the alcohol is mostly cooked off. Add the water or fish stock. Adjust seasoning. Reduce heat to low, and simmer very gently for a few minutes while preparing the gremolata. Combine the lemon zest, parsley, garlic and a sprinkle of salt, mixing carefully until the ingredients are well integrated. Drying the parsley, either by shaking off well or in a salad spinner will maintain the integrity of the garnish. Put the bread in the oven to warm it, and enlist the help of a guest to slice it when it’s ready. Once the cioppino is done, it needs to be served quickly, so the shellfish doesn’t overcook! Add about a cup or so of the beans and some of their pot liquor, saving the rest for another time. Bring the stock to a good boil over medium to high heat. Be gentle with the beans to prevent breaking them up. In the following steps, keep the pot covered; take the lid off just long enough to give things a gentle stir so a good head of steam is retained. The clams take the longest to cook, about five minutes, so they go in the pot first. After about 2 minutes, add the mussels. After another minute, add the shrimp, langostino tails, and smoked fish. Once the clams and mussels have opened, take the pot off the heat, add the lemon juice and tomatoes, and give a final, gentle stir. 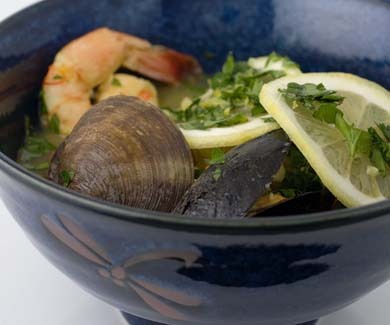 Serve the Cioppino in large, flat bowls, dividing the fish and broth, and discarding any shellfish that have not opened. Sprinkle with the gremolata, and optionally, a thin slice or two of lemon. Put the bread in a basket, and get your bibs on! This lighter version of the traditional Cioppino is more than a soup, but less than a stew. It’s fantastic when the weather is a warmer and the thicker, richer flavors of the original may be too much. Serve with a nicely chilled, crisp white wine, or a lighter style red, and enjoy! 1. San Francisco sourdough is an ideal accompaniment, but any solid, crusty loaf will do the trick. Warm or toasted, buttered or rubbed with olive oil and fresh garlic, it’s fabulous dipped into the rich broth and eaten with the fish. 2. The fresher the dried beans, the shorter the soaking and cooking times. Use good beans! I especially like the heirloom yellow eye beans from Rancho Gordo. They have a wonderful, toasty, slightly smoky flavor, and a great texture. Cannellinis are a good substitute. 3. Some people prefer to brine clams before cooking. It’s really not necessary, but if you want to try it, soak the clams for 15 minutes in a solution of 1/4 cup salt in 2 quarts of fresh, cold water. Rinse and repeat. 4. The best shrimp will still have the shells on. If you can get them that way, by all means, do! Peel and devein them, leaving the tails on, and saving the shells to simmer for a quick stock. Blue shrimp or tiger prawns are a wonderful choice, but any large shrimp will do. You are killing me, what a dish. I have a question about sel gris and kosher salt, what is it? is it salt flakes? Sel Gris, grey salt, is a moist, unrefined salt, usually harvested in Brittany, on Franceâ€™s Atlantic coast. It’s a wonderful “finishing” salt. It’s mineral content gives it a distinctive color and taste. Kosher, or koshering salt is a coarser form of regular table salt, without additives. It’s larger grain size is good for situations where you don’t want the grains to dissolve too quickly. Since it’s the salt I use most often in cooking, I specify it in measurements. A tablespoon of kosher salt will weigh less than a tablespoon of a fine table salt, so if a fine salt is used, the measures need to be reduced by about 1/3. Salt is an interesting topic of discussion. There are so many different types. Not all salts are created equal! Some are good for cooking, some for finishing. Black, red, pink, grey, yellow, smoked, white – each has its place on the shelf. One of these days, Daniel or I will have to write an article. I have tried just a few different types of salt and just those few shows the whide range of salt so i will try get some of Sel gris and for kosher i think we have a similar salt here in sweden we call “Grovsalt” and no added iodine of strange stuff. And i agree salt is a spice of great importance for the kitchen and i look forward reading the article hopefully in a nearby future.